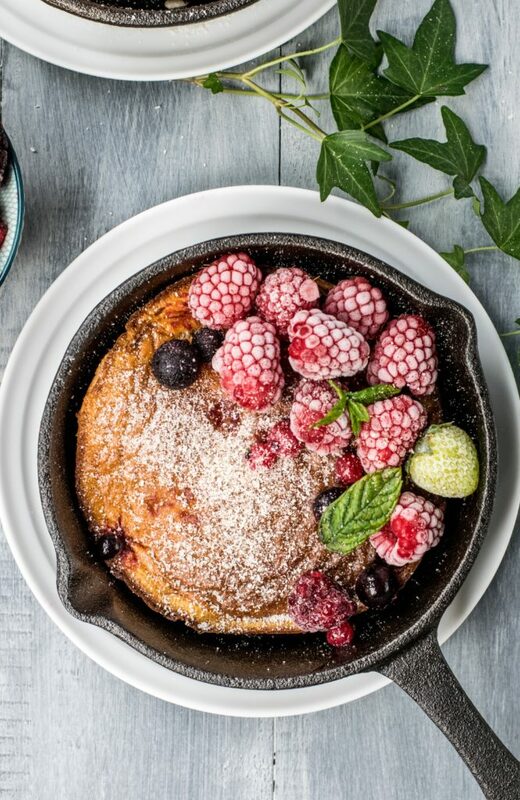 Oven baked berry pan-cakes add to a home cooked weekend brunch. This treat can be made as a vegan, vegetarian or even a gluten-free dish. A great chance to experiment with going egg and dairy free while still indulging. Preheat oven to 375 degrees with rack in upper third. Place a 10-inch cast-iron skillet (or another nonstick ovenproof pan) in the oven. In a bowl whisk together flour, 1/3 tablespoons maple syrup or sugar of choice, 1.5 cups of teas. baking powder, and 1/2 teas. salt in a bowl. Whisk together 1 c. yogurt or milk of choice (i.e. almond), 1 egg or egg substitute (baking soda and vinegar or Flax meal liquid), and 2 Tbl's of vegetable oil or melted butter in separate bowl. Whisk liquid mixture into flour mixture until just combined. Remove skillet from oven and coat with vegetable oil or butter. Pour in batter and smooth top with an offset spatula. Sprinkle evenly with fresh or frozen raspberries, and or blueberries and then sprinkle with granulated sugar type of choice. Bake about 20 to 25 minutes, until golden brown and cooked through, A clean toothpick will tell you it's done. Remove from oven; let cool 5 minutes before garnishing with fruit or confectioners sugar. Serve with warm syrup and or warm berry compote.